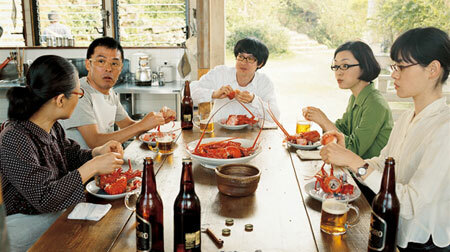 The cast of Glasses enjoying one of the benefits of island life. The Skinny: Watching the latest from Seagull Diner writer/director Naoko Ogigami is just like going on a 100-minute vacation to a Japanese island. Fans of drama and dense plotting need not apply.  Filmed on location on a Southern Japanese island.  Writer/director Ogigami said that she herself couldn't even get any writing done when she first went to the island to work on the screenplay.  The title Glasses was just an impromptu title Ogigami came up with when she noticed that the people she worked with on the film all wore glasses. Every character in the film (except for one notable cameo) wears glasses.